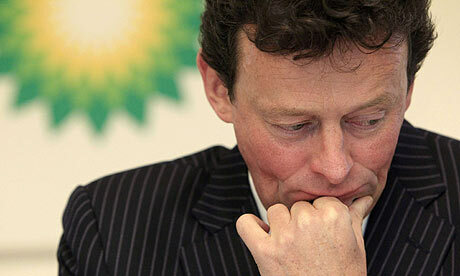 BP chief executive Tony Hayward after the Gulf of Mexico oil spill taking the blame. The BP oil spill is not cool. It's a nauseating shame. But throughout my reading of malicious, high horse posts, tweets and t-shirts, I have to ask, "Aren't we all somewhat responsible?" When a kid knocks a ball through a window (it's not just a cliche, I've seen it happen) don't all parties share some blame for playing too close the house? Or maybe that's just the adult perspective, the kid perspective is, "He did it!" What if the kid knew better than to hit it so hard? Or grabbed the wrong bat? Either way, still an accident, still did't act alone. Or think the old dime store rip-off. Someone makes it out with a pack of free gum or a box of Mike & Ikes and then proceeds to share. Are you implicated for chewing the dirty candy? What if you actually paid someone to do something questionable for your own benefit and then it went terribly wrong? I can't think of too many who have seriously taken up issue with the fact that we drill holes in the earth and in our seas to power our world...until now. Sometimes these events are wake-up calls but more often they're just news stories polarizing victims and villains. Change comes with ownership. With "us" not "them." When poverty, hopelessness and pollution are my problem as much as yours. Because I'm causing it. Because I'm using it. Because I live here too.